The legal and personal pairing of Lamon and Lincoln looked strange even to friends. Certainly, Lamon’s vanity, self-importance and ego were in sharp contrast to Mr. Lincoln’s humility. Lamon was hard-drinking and hard-fighting – as careful of his appearance as Mr. Lincoln was negligent of his. “But it can easily be understood why the frequently melancholy Lincoln longed for the companionship and gaety supplied by this dashing, boisterous, jolly good fellow,” wrote Woldman in Lawyer Lincoln. “This Danville attorney never rose to great heights at the bar. 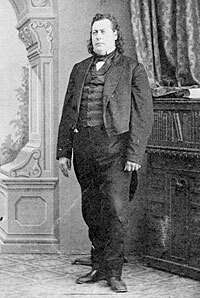 Fellow practitioners held him in rather low esteem as a lawyer…Lincoln, however, closed his eyes to all of Lamon’s imperfections and clung tenaciously to their companionship.” Like him or not, it was hard to ignore the impose, barrel-chested figure of Lamon. 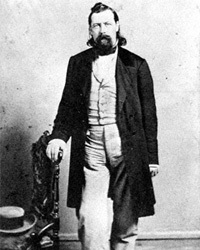 Two years later, Lamon played an important role in one of the critical events of the 1860 Republican National Convention in Chicago – the printing and distribution of extra, counterfeit tickets for Illinois Republicans which allowed Lincoln supporters to outscream those for William H. Seward – many of whom failed to gained admission to the convention hall. According to Lamon, “The President gave me private instructions to execute the laws until Congress modified or repealed them. ‘In doing this,’ Mr. Lincoln said, ‘you will receive much adverse criticism and a good deal of downright abuse from members of Congress. This is certain to come, but it will be not so much intended for you as for me; as our friend Senator [John P.] Hale, the other day, said in the Senate, ‘We must not stroke too high nor too low, but we must strike between wind and water: the marshal is the man to hit.’ And I say, we shall have to stand it whatever they send. '”17 Conflicts with other government authorities led Lamon to submit his resignation at least once, but the President declined to dismiss him – but he could not stop Congress from limiting Lamon’s compensation. Ward Hill Lamon, Recollections of Abraham Lincoln, p. 14-15. Rufus Rockwell Wilson, editor, Intimate Memories of Lincoln, p. 111 (Clint Clay Tilton, paper for Historical Society of McLean County). Albert A. Woldman, Lawyer Lincoln, p. 102-103. Ward Hill Lamon, Recollections of Abraham Lincoln, p. 17. Ward Hill Lamon, Recollections of Abraham Lincoln, p. 16. Ward Hill Lamon, Recollections of Abraham Lincoln, p. 22. Willard L. King, Lincoln’s Manager, David Davis, p. 175. Ward Hill Lamon, Recollections of Abraham Lincoln, p. 28-29. Douglas L. Wilson and Rodney O. Davis, editor, Herndon’s Informants, p. 290 (Report of Allen Pinkerton , February 22, 1861). Douglas L. Wilson and Rodney O. Davis, editor, Herndon’s Informants, p. 293 (Report of Allan Pinkerton, February 23, 1861). Ward Hill Lamon, Recollections of Abraham Lincoln, p. 182-183 (Recollections of Abraham Lincoln). Carl Sandburg, Abraham Lincoln: The War Years, Volume II, p. 487. Carl Sandburg, Abraham Lincoln: The Prairie Years and the War Years, p. 350. Ward Hill Lamon, Recollections of Abraham Lincoln, p. 255. Ward Hill Lamon, Ward H. Lamon and the Chicago Tribune, p. 4. New York World, September 9, 1865, . Roy P. Basler, editor, The Collected Works of Abraham Lincoln, Volume VII, p. 548-550 (ca. September 12, 1864). Ward Hill Lamon, Ward H. Lamon and the Chicago Tribune, p. 6-7. Ward Hill Lamon, Recollections of Abraham Lincoln, p. 336-337. Ward Hill Lamon, Recollections of Abraham Lincoln, p. 170.